Simple Passive Income > Blog > How to earn money online with neobux > Online Searches for ‘Bitcoin’ – Why is South Africa One of the Leading Inquirers? What About the Economic Recession in 2018? The recent recession (early in 2018) in South Africa is not likely to have had a meaningful impact on South Africa’s interest in Bitcoin. Of course, there were some uninformed people who grabbed Bitcoin in an attempt to hedge themselves against the recession. However, the recession was not an important driver of SA’s interest in Bitcoin. Could it be South Africa’s Political Instability? Some may reason that this instability could have driven South Africans to Bitcoin. However, Bitcoin itself is an unstable and extremely volatile asset. But humans make mistakes and many times cleave to their own beliefs and biases. And in the process, they sometimes pour money into what they esteem to be “one of the safest assets” or “a powerful hedge against the rand and other fiat currencies”. You see, it is really irrational to put your trust in Bitcoin in times of instability. After all, how stable could we expect Bitcoin to be? It has hardly been around for 10 years and has displayed monstrous volatility so far. My point is that South Africa’s instability isn’t a good reason for people to be drawn to Bitcoin. If you really need a hedge against a weakening rand or other adverse economic circumstances, there are many other options besides Bitcoin. And by the way, Bitcoin lost about 75% of its value in 2018. That 75% loss did not hedge anyone against anything! Bitcoin appeals to some tax evaders and criminals because its transactions are pseudo-anonymous. It can also be sent basically anywhere in the world without passing through banking channels where South African Revenue Services (SARS) could notice it. Many South Africans love to evade tax, and it may be thought that South Africa’s interest in Bitcoin could have something to do with tax evasion. However, many other countries around the world also abound with tax evaders, so SA is not unique in this regard. And besides that, there are many other ways to evade tax in South Africa. Also, getting Bitcoin without buying it on a cryptocurrency exchange with funds from your personal bank account is not a viable option for everyone and is sometimes very expensive. While tax evasion has without a doubt drawn some South Africans to Bitcoin, it is certainly not the most important influencing factor. Do South Africans Fancy Bitcoin for Peer-to-Peer and International Money Transfers? “Bitcoin is a really cheap and convenient way to send money abroad”. Really? If you need to send money abroad, why not just go to your bank and request an international transfer? It’s much cheaper than converting rands to Bitcoin, sending the Bitcoin abroad, and then converting Bitcoin to that country’s fiat currency. Perhaps the recipient will use the Bitcoin directly which eliminates a Bitcoin-to-fiat conversion. Well, in that case, it is usually still more expensive than just sending rands abroad with your bank handling the currency conversion. Besides the high cost of fiat-to-Bitcoin and Bitcoin-to-fiat conversions, it is also more cumbersome than just using your bank or even Paypal to move money to other countries. Plus, when using traditional methods, you don’t have any risk of losing your private keys. Losing a private key makes your own Bitcoin unaccessible to you, which means that you have actually lost your Bitcoin. Concerning peer-to-peer money transfers, using Bitcoin for that can also be impractical in many cases. We should also not forget that Bitcoin’s excessive price volatility greatly reduces its potential as a reliable payment medium or store of value. Surely, some South African people have investigated Bitcoin as an alternative means to move money. 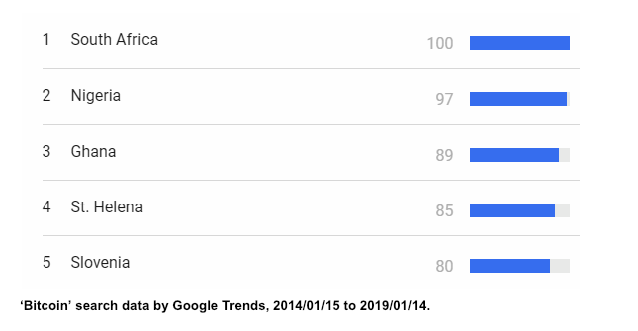 However, this is very unlikely to have distinguished SA from the rest of the world, in terms of search numbers. What About SA Being an Emerging Market? These top 5 countries, South Africa, Nigeria, Ghana, St. Helena, and Slovenia are all emerging markets. Really interesting! And of these countries, 3 are in Africa. Of course, St. Helena is just about 1900 km from Angola in the Atlantic Ocean. We can almost say it’s part of Africa. Speculation and Investment Purposes? Definitely! 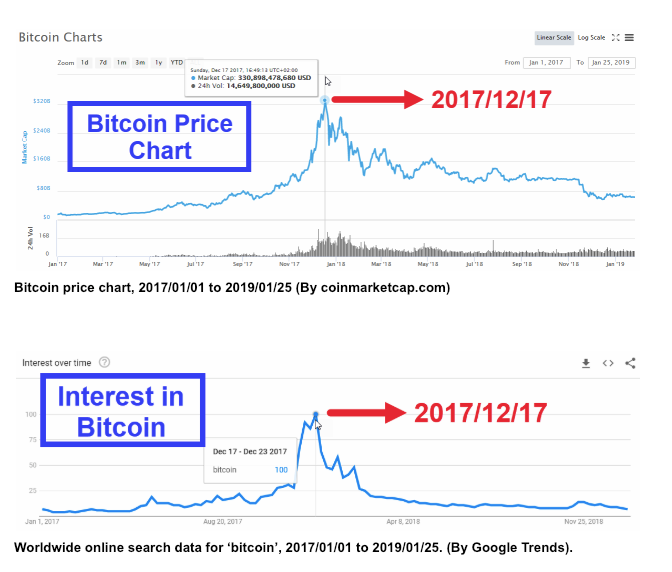 When Bitcoin hit an all-time price high in December 2017, the worldwide interest in Bitcoin also printed an all-time high. But why does this matter? Well, when the price of Bitcoin moves higher, people show more interest in it. This tells us that people are interested in Bitcoin because maybe they can make some money out of it. Surely, many people who searched for Bitcoin were just curious, but a multitude of people were drawn to it because of the magnificent gains it produced in a really short time. Some of the early Bitcoin investors literally made millions of percent return on their investments! Of course, the early Bitcoin miners who stacked up their Bitcoin also made really impressive gains. Here we can see that when it comes to ‘trading Bitcoin’, South Africa is far ahead of Nigeria and all other countries in the world. It is evident that South Africa likes to speculate, trade, and invest! Not only do South Africans like Bitcoin, but also forex, stocks, and commodities. South Africa is one of the leading emerging markets in Africa. This, combined with South Africa’s incredible appetite for speculation, are the most important reasons why South Africa lead the world in online Bitcoin inquiries over the last couple of years. Eric Furstenberg, co-author at www.tradeforexinsa.co.za is a versatile entrepreneur, speculator, and technical writer. He also develops trading robots and has extensive experience in online trading. For more crypto articles by Eric and his colleagues, please visit www.tradeforexinsa.co.za/crypto/crypto-education/.